These pictures were taken on July 3, 2005, in Alf on the middle Mosel River, a small wine-growing and tourist village. The monument is located near the river bank, facing the main road along the river. Alf is a small town, even today. It is conceivable that the population was larger 90 years ago, during World War One, when wine growing was more labor intensive. But even so, the list of names shows that the town was devestated by the war. The monument was probably built in the 1920s or 1930s, judging by the architecture. It is dedicated "To Our Heroes". This picture shows the memorial in context, right in front of a small row of parking spaces, between houses. The words read, "To Our Heroes". It is hard to tell whether the monument is still "in use" or has fallen into neglect. Someone is still paying or volunteering to have the grass and flowers kept up. Cracks in the monument have been repaired. The candle has been used, but it is hard to tell how recently. 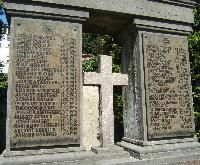 The top two plaques list the fallen from the First World War. 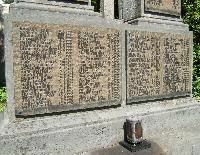 Since the names are listed according to the dates they fell, and not alphabetically, it is hard to see family matches. 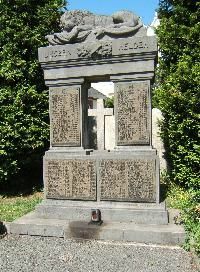 But notice that the Bömer family (which runs one of the town's nicer hotels) lost five members in WWI and six more in WWII. The bottom half lists the names of the World War Two fallen, but those plaques were probably added later. The last ten names on the WW2 section are in a section labled "Fallen on the home front" and include women. They were probably not civilians, however, but anti-aircraft support, nurses, or other uniformed personnel.